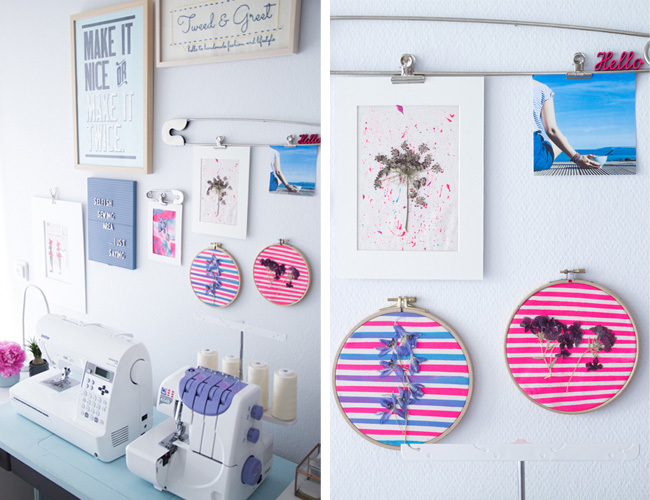 Tilly and the Buttons: Sewing Space Tours... Selmin's Gorgeous Space! Hi! 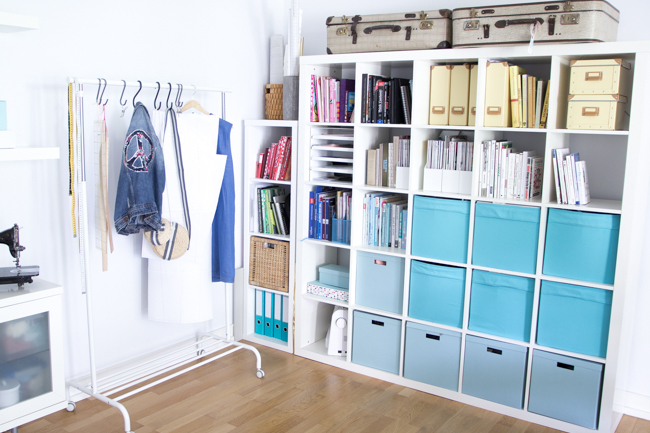 I’m Selmin from Cologne in Germany, and I am really happy to show you around my sewing space today. I only discovered sewing five years ago, and got excited about it straight away. Two years later, I took a year off from my sales and marketing job at an IT consulting firm for a professional re-orientation. Whereas others would start travelling, I took my sewing machine and started a year long "sewbatical", which I also used to start my sewing blog, Tweed & Greet. 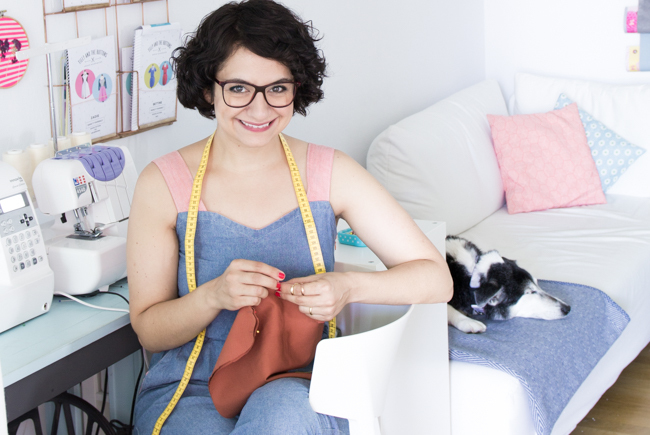 I loved this time, and it not only led to 35 handmade garments, but also to full-time blogging and working as a freelancer on creative projects that combine my two favourite activities: sewing and writing. My blog is about my handmade outfits, tips, sewing tutorials and stories around the sewing table. I love sewing my every-day clothes and discovering new patterns that suit my style. In January 2016, I decided to stop shopping for clothes until the end of this year and only sew everything I "need"! At the time of writing it’s going really well, but I'm really into fashion, so my "to sew" list is getting ever longer as new, gorgeous patterns are popping out almost every month! When I started sewing, I occupied more and more space of our guest room for my sewing activities, until I finally took over the room entirely. It took me a few years to organise and create everything into the way it looks now. I love spending time on Pinterest or Tilly’s Sewing Space Tours, peeking into other sewist’s working spaces and getting inspired. 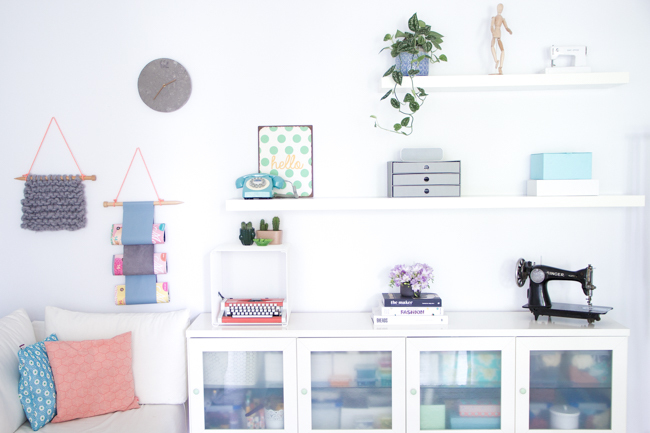 My room is a mix between contemporary pieces, DIYs, and vintage items. 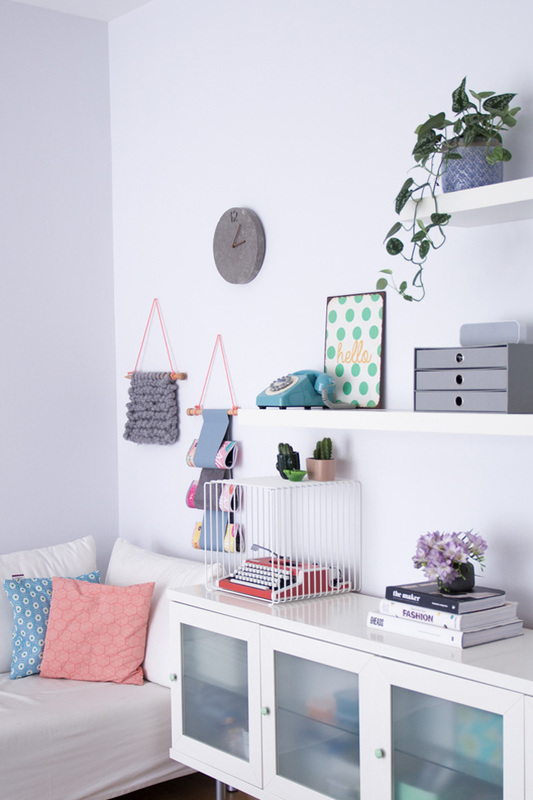 I love bright and soft colours and wanted to use them in my room, too. Flowers are another passion of mine so I always have fresh flowers in my room which I buy from our local market every Saturday. While sewing, I like listening to sewing podcasts, such as Maker Style, Modern Sewciety, and the hilarious ladies from Sewing Out Loud. I love my old Singer sewing table, which I painted in blue, my favourite colour, last year. It was a very exciting project for me, as I never really thought of myself as a creative person before I started sewing. It all arose when I took my year off, and I sometimes still have to push myself into projects if I think I won't be able to do them. With this project, I bought a sander and paint and just got started. I am really proud of the result, it has definitely become a special piece in my room. Another special piece has nothing to do with sewing, but it carries a lot of happy childhood memories. It's an old typewriter from the 70s with a Turkish keyboard, belonging to my dad. 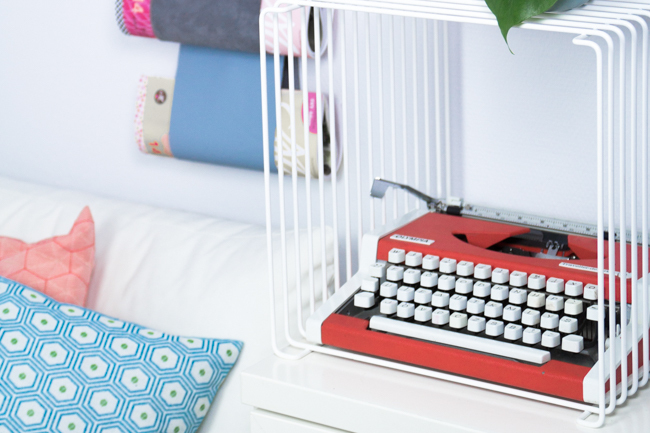 I loved typing poems and little stories on it every afternoon when I was a child, pretending I was a poet. When my parents moved back to Turkey years ago, they left this machine with my sister. She passed it to me two years ago. It is still working and I love to push down the buttons, just to hear that lovely sound of my childhood. 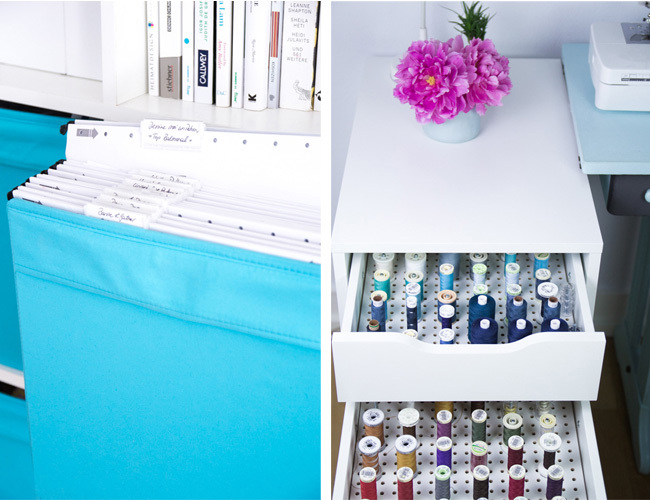 It has a special place in my heart and in my sewing room. You might not be able to tell from the pictures, but I am a rather messy person! Over the last year I acquired a few tricks to stop myself from being so messy. 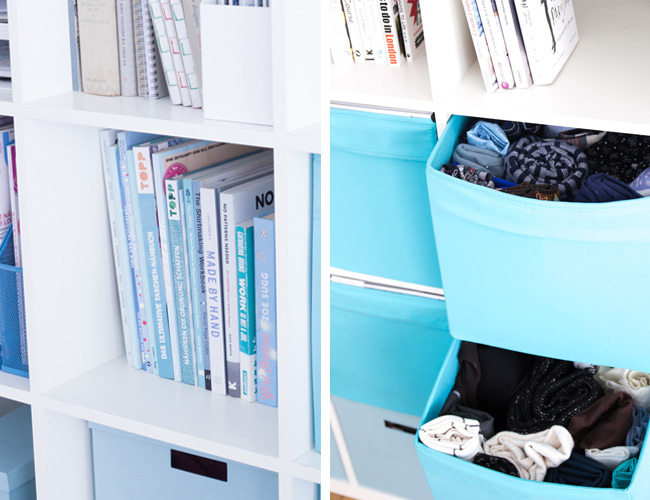 Firstly, every item has its own place. Materials are stored in boxes, next to each relevant working space. Next to my sewing space, I have everything that is directly related to the sewing process: thread, scissors, needles. Next to my pattern cutting table (which I also use as my desk) is a little trolley with fabric cutting and writing materials. My patterns are stored in Ikea boxes so that I can quickly put them back after use, whilst current patterns are on a rack. Another thing that has really helped has been having a calendar note on my phone that pops up at 10pm every day, reminding me to tidy up. This way, I'm reminded to put things back in their place in the evening and start fresh on the next morning. So far, it’s working perfectly. My room is more than an home office and sewing room to me. It is my creative happy place in which I spend most of my time of the day, joined by my dog Max, who likes to use fabric and sewing patterns as sleeping blankets. I spend so much time in this room that even my husband has started spending his free time on my room’s couch for our chats. One day, I’d really love a big studio where I could give sewing workshops and sew together with likeminded people. Until then, my room is the perfect place to keep on working on that dream. 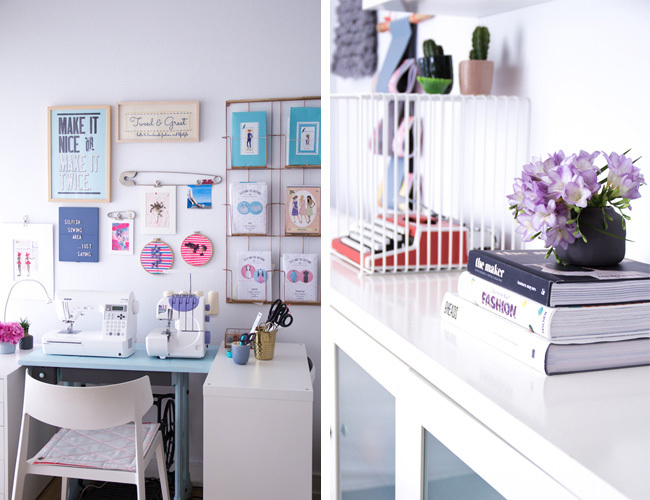 Thank you for sharing your gorgeous sewing space with us, Selmin, and for pioneering the "sewbatical" - something we can all get on board with, surely!? Have you seen the other incredibly inspiring places that are part of our Sewing Space Tours? Kick back and have a look here. If you'd like to submit your space for consideration, have a look at our submission guidelines. We can't wait to see yours!